You've almost certainly said something you regretted in a chat, whether it was because you were tired, angry, or just looking at the wrong conversation — but Facebook Messenger could soon get a feature that'll let you take those misguided statements back. Evidence has been found that an "unsend" option is in the works. 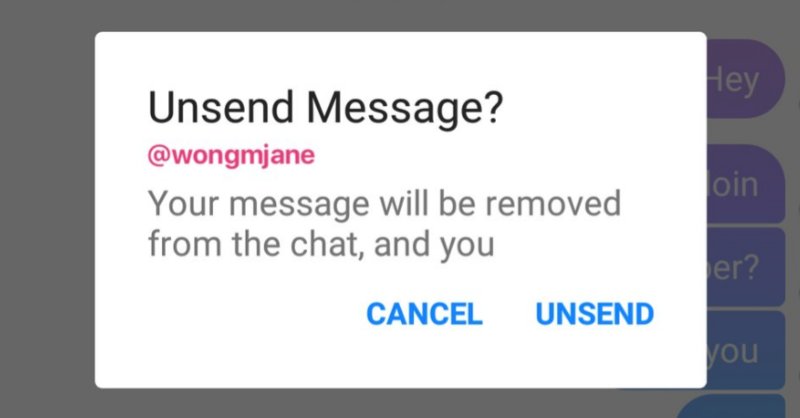 The implementation seems pretty straightforward: long pressing on a sent message will give you options to delete it or unsend it. Deleting a message will remove it from your side of the conversation, while unsending it will remove it from the receiving party's view, as well. Jane Wong notes that you'll only be able to unsend a message for a set amount of time after it's been sent, so you won't be able to erase your mistakes the morning after. You also probably won't be able to unsend messages after they've been seen, since that would be more confusing than useful. There's currently no indication of when this feature will be available, only that the Facebook team is working on it. So for now, just keep thinking before you text. According to TechCrunch, the unsend feature is now rolling out to Facebook Messenger for Android and iOS in select countries — Poland, Bolivia, Lithuania, and Columbia — ahead of a wider launch very soon. It's officially called Remove for Everyone, and will leave a little tombstone behind so the recipient is aware that something has been deleted. It sounds very similar to what we have right now on WhatsApp, which is owned by Facebook. You'll have just 10 minutes from the moment you send a message before you can no longer delete it. Facebook will retain messages for a little bit longer, just in case any are reported by a recipient and need to be investigated. Apparently, messages and threads with predetermined expiration dates are also in the works.